Am Samstag gibt es wieder unseren Intercultural Walk mit unseren Perspektivcoaches! Kommt vorbei – los gehts um 13:00 Uhr am der roten Info-Box am Feldeingang Oderstraße. 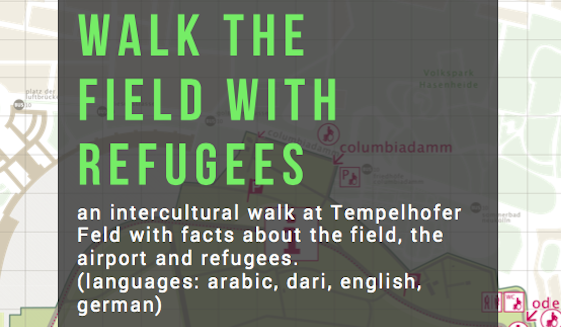 On saturday there will be our next intercultural walk across the Tempelhofer Feld with our Perspektivcoaches with facts about the history of the field, the projects, and the airport. Listen to experiences of arriving in Berlin as a refugee and explore the possibilities of the field. Come and join us and bring your friends! The tour is for free.